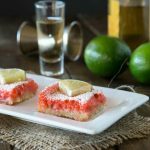 Strawberry Cream Squares – light and creamy layers with fresh strawberries and a graham cracker crust. 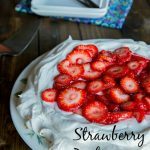 Easy and delicious no bake dessert! I love no bake desserts. Seriously, in the summer especially they are the only thing I make. 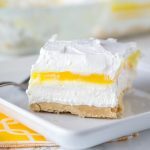 Lemon Lasagna Dessert? Yep, on repeat when I need to go to parties all summer long. Or maybe No Bake Oreo Cheesecake. You get the flavor of cheesecake, but you don’t have to have the oven on for hours. Can’t beat that when it is hot out. 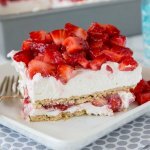 And as soon as strawberries start showing up in stores, all I can think about is Strawberry Ice Box Cake. Just something about strawberries and cream together. 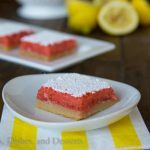 Strawberry desserts are always a favorite with my entire family. 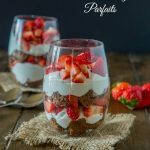 Easy no bake desserts are kind of my specialty, so today I am sharing one that is for all the strawberries and cream lovers out there. 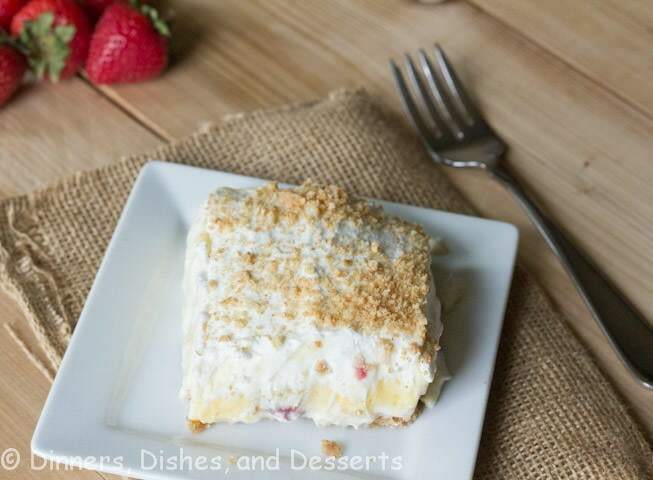 These cream squares have a graham cracker crust topped with a sweetened cream cheese layer. Then a layer of vanilla pudding and then whipped cream. Layer after layer of creamy deliciousness! Fresh strawberries are folded into the layers, so you get a burst of slightly tart berries in each bite. Strawberry desserts are definitely a favorite in this house. Strawberry Crumb Bars are made every summer as soon as local fresh strawberries are available. I first made this dessert years ago. My husband found it online, and immediately asked that I make it. He is not a chocolate person, more of a Key Lime Pie kind of guy. So strawberry desserts are definitely his thing. I made this with fresh strawberries, but you could easily do frozen. You could even change up the fruit to whatever your favorite is; blueberries, raspberries, bananas etc. The layers remind me of dream bars. This Circus Animal Cookie Dream Bar is one my husband loves. I made it for him once, and he has been asking for it like crazy since. 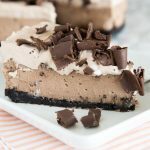 There is just something about layers of creamy goodness with a cookie crust! 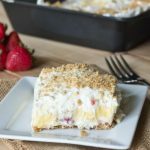 No bake desserts are a life saver when it is hot out, but they are also great when you are short on time or just want something tasty to eat. 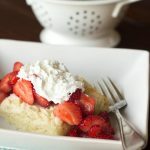 So pick up some strawberries from the store and add this Strawberry Cream Squares recipe to your must make list. It will definitely impress next time you have guests over! 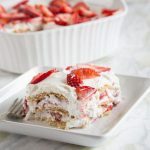 Strawberry Cream Squares - light and creamy layers with fresh strawberries and a graham cracker crust. 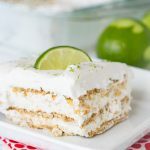 Easy and delicious no bake recipe! Mix the crushed graham crackers and the butter together. Press (reserve 1 Tbls of crumbs) into the bottom of an 8 in square baking pan. Place the refrigerator to harden while you prepare the filling. Mix the cream cheese and sugar together until well combined. Fold in the strawberries. Spread evenly on top of the graham cracker layer. Combine the milk and the pudding mix and whisk for 2 minutes. Pour over the cream cheese layer. Place in the fridge for 1 hour to set. Remove and spread with layer of whipped cream. Sprinkle reserved graham cracker crumbs over the top. Refrigerate for 3-4 hours to completely set. Your cream cheese squares look out of this world. Oh my gosh!!! Oh, my. My hubby would love these, too…but it’s my son who sends me texts with links to decadent desserts…LOL. Just you wait 😉 Perfect end of the summer dessert, Erin! Happy #SundaySupper! No bake dessert! I’m there! This looks amazing! And almost too easy for all that deliciousness! 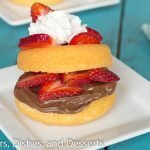 What a great dessert for a party! This looks so rich and creamy and I’m a sucker for strawberries. Thanks for lightening it up! 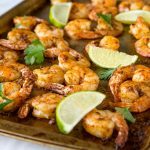 I know that “Yum” would be what my husband would say about this recipe. He loves strawberries and whipped cream and this just takes it up on level. 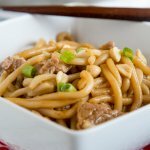 Great recipe and thanks for sharing. I love this dessert…so good! beautiful bars to celebrate the Labor Day. Oh my…this looks so creamy and delicious!! this is something I think my whole family would absolutely love! Thanks! This looks incredible. I have to go and eat some now. I am literally drooling!! I have to agree with your hubby, it looks decadent! What an awesome recipe. Your husband is one smart cookie. I can’t wait to try this fabulous recipe! 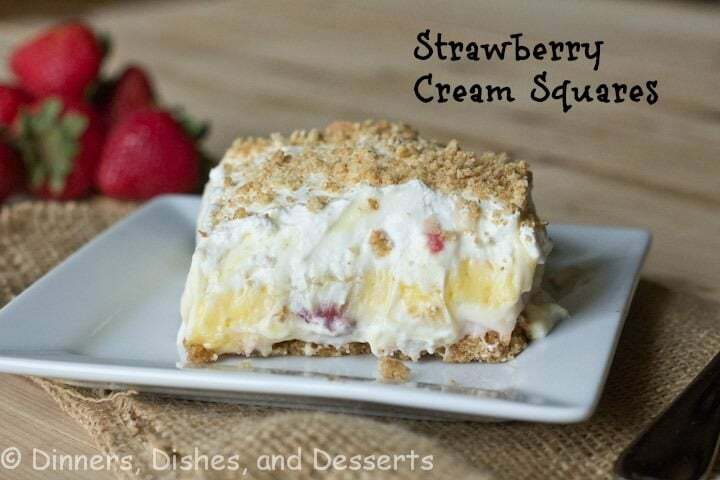 My family would like this dessert too, looks like a great dessert for a BBQ or potluck. 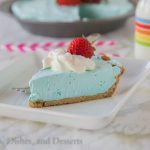 I love the graham cracker topping, a perfect dessert for Labor Day! oh my! your berry cream cheese squares look out of this world, E! What a lovely desert. Oh my this looks so good. What a perfect dessert for a Labor day party. I wanted to be invited to that party. Your strawberry cream squares look so light but decadent. I want some. Oh my yumminess, this looks so good. I think I need to run to the store now to make this. Happy Labor Day! This is one delicious-looking dessert bar! Kinda like strawberry shortcake…in a pillow-y bar form. Heehee. This sounds like my kind of dessert! And no-bake? Yes, please! Thanks for sharing! What a perfect dessert to end summer! Delish. Hope you had a wonderful Labor Day Weekend!! I’m totally drooling over this amazing looking dessert, all creamy like. Yum! I seriously can’t wait to try this. Pinned! Looks yummy and very light! These look so creamy! It would be so dangerous to have these around the house! I would eat the entire pan! So delicious and perfect for a party we are attending this weekend! Getting the ingredients today! Now that it’s getting warmer, no bake desserts are a must! This one looks like a winner! Such an amaaazing dessert!! My family will LOVE this!! 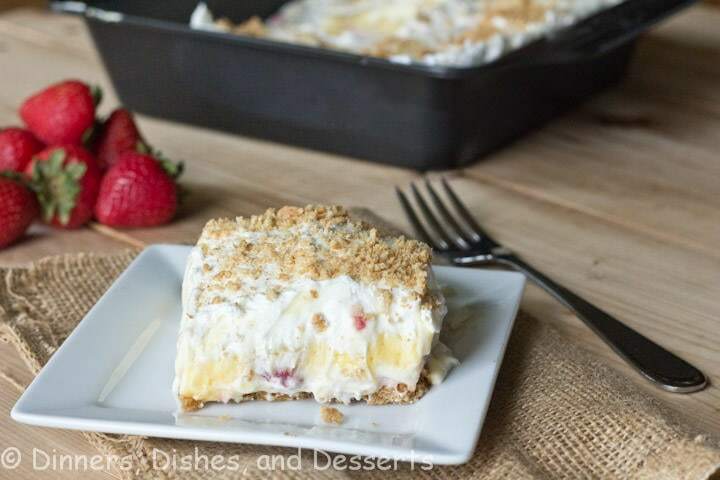 I just love no bake easy desserts like this, and it’s definitely going on our menu soon! 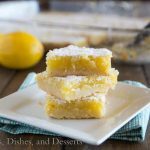 This looks like a great spring dessert. This looks really good! I can’t wait to give this a try! These look SOOO creamy! Must try!